December 19th 2010 - Along with the beauty of fall days comes the need to get ready for winter. Time to get out my long underwear and my warm wooly socks. Time to nourish my immune systems so cold days won't be days of colds -- and flu. I don't rely on modern medicine to keep me healthy, but if you usually rely on a flu shot to protect you, you may feel frightened by your inability to get one this year. You may be wondering what you can do instead. Or you may have discovered that flu shots don't give protection from all types of flu, just the ones the makers guess will be active this winter. And you may wonder if there isn't some other way to prevent the flu. Or maybe, like me, you prefer not to use shots or drugs unless absolutely necessary. You may wonder what herbs and remedies are the best to have on hand to help your family deal with the flu. No matter what your situation, now is a good time to give yourself the benefit of Wise Woman Ways to prevent -- and deal with -- the flu. These flu presenters and flu remedies are simple. They are quite safe. And you don't have to be rich to use them. Wise Woman herbal medicine is people's medicine. Mama Medicine. You can buy most of the things I discuss in this article -- and you can find them growing freely, too. You can buy the herbal preparations I mention already made -- and you can easily make you own for pennies, too. These Wise Woman Ways are supported by both tradition and science. Wise women through the centuries have kept themselves and their families safe from contagious diseases. And science has found good reasons for their effectiveness. I hope these tips will help you face winter's ills with confidence, and good health. Drink nourishing herbal infusions daily. Make immune-strengthening soups; or add immune-strengthening herbs to canned soup. Use anti-viral herbs as needed. One of the best immune-system helpers is garlic. Dr. James Duke says it contains at least 17 different factors that nourish and support powerful immune system functioning. Herbalists in the middle ages relied on it to prevent infection from the plague, so it might keep us safe from the flu. Garlic is anti-bacterial, too. If you don't like fresh raw garlic, powdered garlic is just as good. The dose is 1 or more cloves of raw garlic per day, or up to a teaspoon of garlic powder. Top scrambled eggs with minced raw garlic. Put chopped raw garlic on pasta and cover with tomato sauce. Try minced raw garlic on a piece of hot buttered toast. Delicious! Add minced raw garlic to your baked potato. Mix chopped raw garlic and olive oil with hot cooked greens like kale or spinach. Nourishing herbal infusions are the basis of great nourishment for the immune system and the entire body. They are full of antioxidant vitamins, minerals, proteins, phytoestrogens, and hundreds of protective phytochemicals that work to help you ward off the flu and colds too. 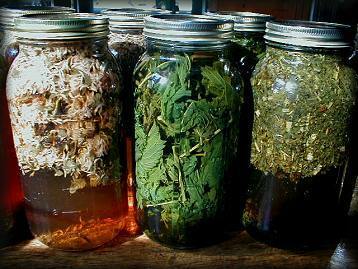 Choose one herb: nettle, oatstraw, red clover, comfrey leaf, linden flowers, or violet leaf. Place one full ounce, by weight, of any one herb in a quart jar. A canning jar is best. Fill the jar to the top with boiling water. Let it steep for four hours, or overnight. Strain the liquid out, squeezing the herb. Refrigerate the infusion, where it will be good for 24-36 hours. I drink two to four cups nourishing herbal infusions daily -- over ice, heated up with honey and milk, or mixed with other beverages. Cooking herbs and vegetables together for a long time extracts minerals, actives immune-strengthening phytochemicals, and increases the levels of available antioxidants. Raw foods weaken and stress the immune system. Chop at least half an onion per person and saute in olive oil until translucent..
Add at least two cloves of garlic, sliced or chopped, per person and saute for a minute. Add two or more cups of water or vegetable broth per person. Add one cup per person of chopped seasonal vegetables such as: carrots, cabbage, celery, corn, burdock, turnips, potatoes, tomatoes, parsnips. Add one small handful of seaweed per person. Add one ounce fresh, or one-half ounce dried mushrooms -- any kind -- per person. Add one-quarter ounce dried tonic roots per person. Add generous amounts of antioxidant seasoning herbs and some sea salt. Bring to a boil; simmer for an hour. Turn off fire and let your soup mellow in a cool place overnight. Serve it the next day, heated up, with freshly-baked bread and organic raw milk cheese. Seaweeds build powerful immunity. Kombu and wakame are excellent in soups. Cut them small; they swell to 5-7 times their dried size when cooked. All mushrooms strengthen the immune system. Dried shitake are available and inexpensive at Chinese grocery stores. Reishii, maitake, and other medicinal mushrooms are delicious, as are the more common button mushrooms, portobellos, and dried porcinni. Seasoning herbs from the mint family -- rosemary, thyme, oregano, basil, marjoram, and sage -- are loaded with antioxidants. I don't just season the soup with them, I add them by the handful for the greatest impact on my immune strength. Anti-infective herbs can help us prevent the flu -- and assist us if we do get sick. Colds and the flu are caused by viruses, making them more difficult to treat than bacterial infections. Viruses are more vital than bacteria and harder to kill. There are many anti-bacterial herbs -- including yarrow, echinacea, elecampane, and poke -- but few that are anti-viral. Of these, my favorite is St. Joan's/John's wort. If any herb can prevent the flu, St.J's can. Of course, even flu shots don't prevent all types of flu, and they don't prevent colds, so even if you do get a shot, it's a good idea to have some anti-viral and anti-bacterial herbs on hand. The distinction between them is not so important once you are sick. Both types of herbs will alert the immune system to the infection and help it gather the resources needed to counter it. Did you know that the achy muscles and headachy feeling we get with the flu is not caused by the flu itself but results from the immune system gobbling up all available resources so it can clobber the flu virus. This beautiful yellow flower yields a blood-red tincture that I take by the dropperful to prevent viral infections such as the flu. A dropperful in the morning throughout the cold months is adequate for prevention. I increase that to 2-3 dropperfuls a day if I have been exposed at home or at work to the flu. If I do get sick, I will use other herbs to counter the infection. Capsules of St. J's are ineffective; I only use the tincture. The tincture of echinacea root is a well-known anti-infective. When I feel an infection brewing, I use large doses of echinacea to build white blood cells and encourage T-helper cells. The dose of echinacea root tincture is 1 drop for every 2 pounds of body weight, as frequently as every hour or two in the acute phase of an infection, 2-4 times a day otherwise. I have seen echinacea relieve terrible flu infections. Important: I do not use echinacea as a preventative; it doesn't seem to work that way. I do not use any part of this plant except the root. I do not combine it with goldenseal, which I believe hinders the immune system. I do not take echinacea in capsules. I make a quart of echinacea tincture each fall as my winter insurance. Here's how I do it: Put 4 ounces of dried Echinacea augustifolia root in a quart jar. Fill to the top with 100 proof vodka. Cap tightly and label. Shake daily for the first week. Then weekly for at least eight weeks. The tincture of this root is so powerful some authors consider it poisonous. You may have a hard time finding it for sale. But poke is an important helper when flu "bugs" have taken over. I would not take poke as a preventative; it is far too strong. I use poke root tincture to kick my immune system into high gear. The dose is one drop -- yes, only one drop -- once or twice a day for no more than a month, although in serious cases I may use up to 8 doses a day. Poke root tincture can harm the kidneys if it is taken continuously. I never take capsules of poke root. The tincture of this root is a favorite for clearing lung infections and countering the flu. The usual dose is 10-15 drops 2-3 times a day, but I would increase the dose to 6 times a day in an acute situation. I expect to see results within a day or less. I would only take elecampane if I had an active infection; it has little protective value. I never use elecampane capsules. Elder flowers are a nice remedy for those with a feverish cold, but for those with the flu, I prefer elder berries. The most common way to take them is in the form of a syrup. The immune enhancing properties of elder berries are renowned in Europe and slowly gaining popularity in the United States. Elder berry syrup also eases coughs and lung congestion. Herbs may not seem strong enough to prevent or counter the flu, but they are. When we use herbs to maintain and regain health, we not only take a big step toward health independence but a small step toward peace on our planet. Instead of making war on weeds, I use them. Instead of making war on nature, I let Her guide me. Instead of making war on myself when I'm sick, I nourish myself toward greater health, greater peace. Green blessings surround us. Herbs not only protect us from the flu, they can uplift our hearts and bring us joy in trying and uncertain times. 1. Wash your hands, this is the single best way to avoid the flu. 2. Cough or sneeze into your elbow, not your hand. Viral particles are easily passed from hands to eyes and nose even if you use a tissue. 3. If the flu is active in your area, avoid public places.